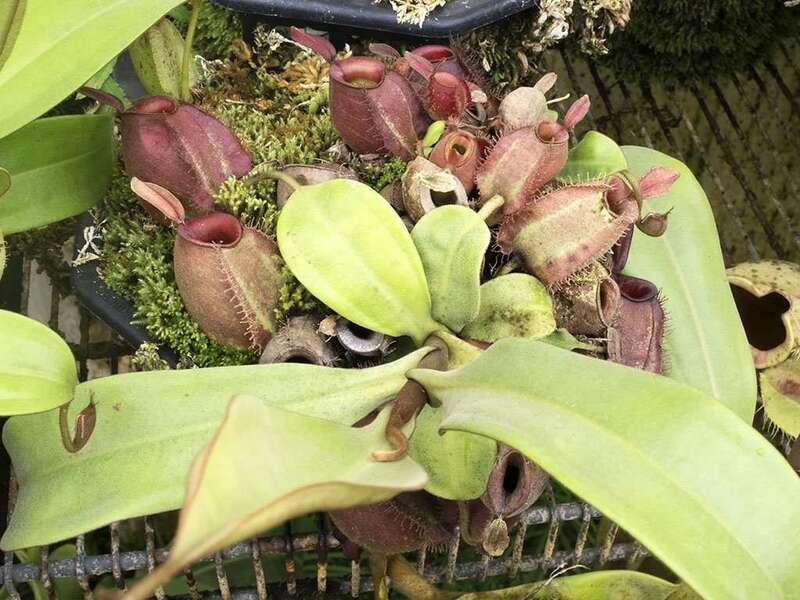 To say Nepenthes ampullaria is unique, among a sea of unique Nepenthes, would be an understatement. 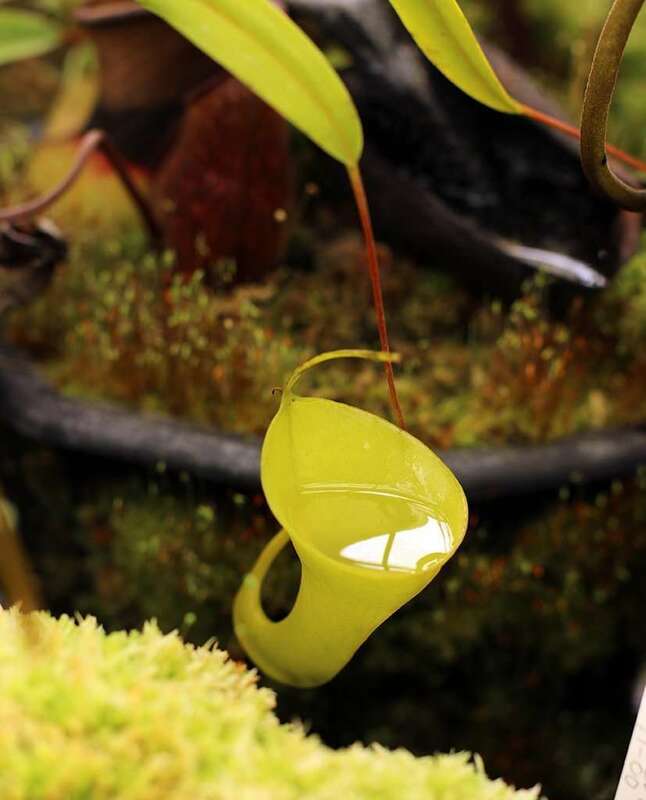 This lowland tropical pitcher plant is truly something special. N. ampullaria produces small, oblong, squat ground pitchers in numerous colorful shades. It is a detritivore, consuming detris. This means it eats decomposing plants and animals as well as feces. Versatile! 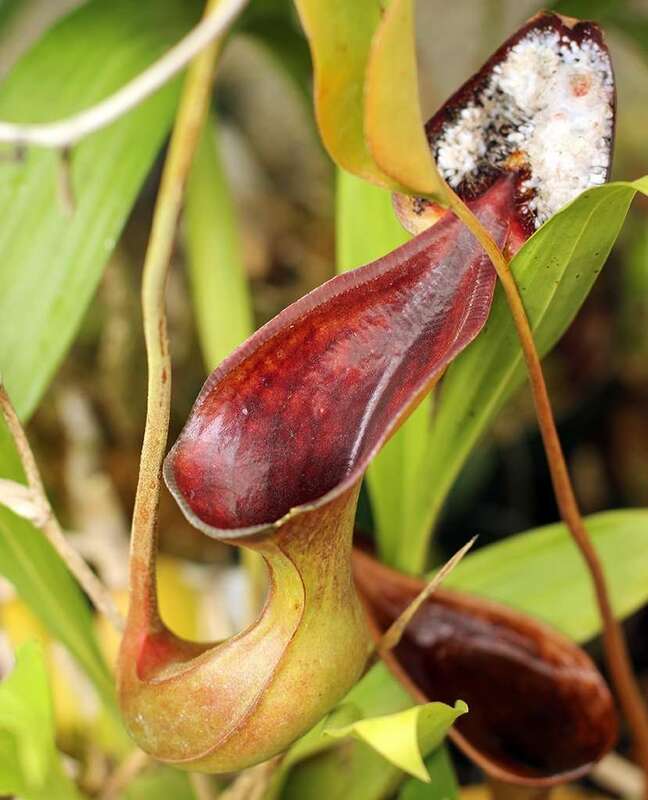 You will often find a cluster of 1 to 3 inch (2.5-7.5 cm) pitchers resting on the forest floors in New Guinea and the Malay Peninsula where they collect not only insect prey, but also leaf debris, as well as playing host to some uniquely evolved local critters. 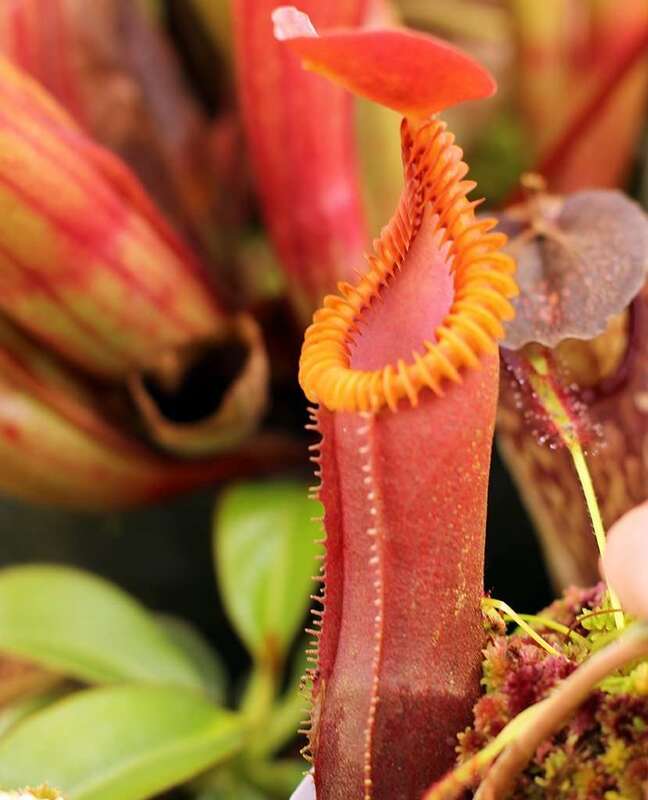 From crabs to mosquitos, coevolution makes N. ampullaria not only a fascinating Nepenthes, but one responsible for the survival of multiple mutualistic and scavenging species – upwards of 60 unique organisms by some counts. 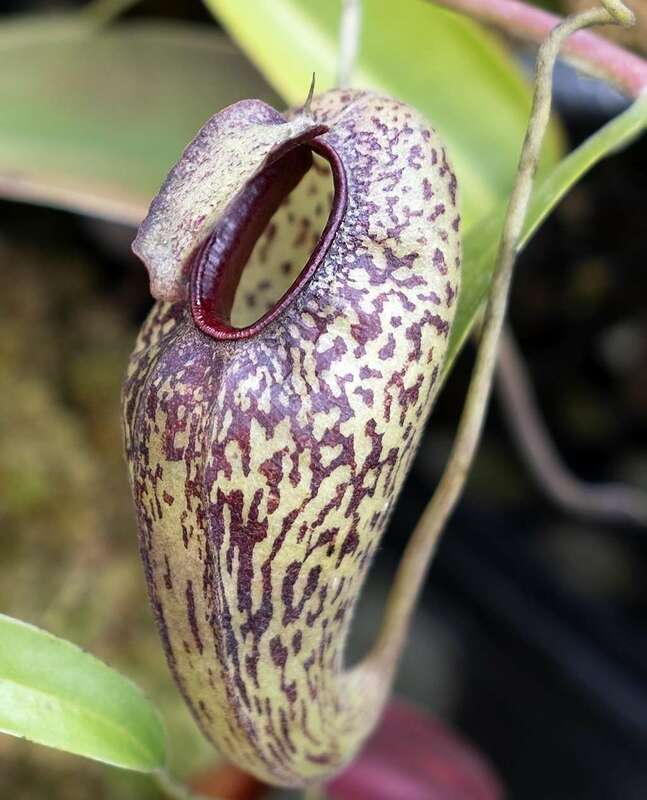 Nepenthes ampullaria is a variable little tyke, with pitchers ranging from pure green, to red-spotted, all the way to nearly black. 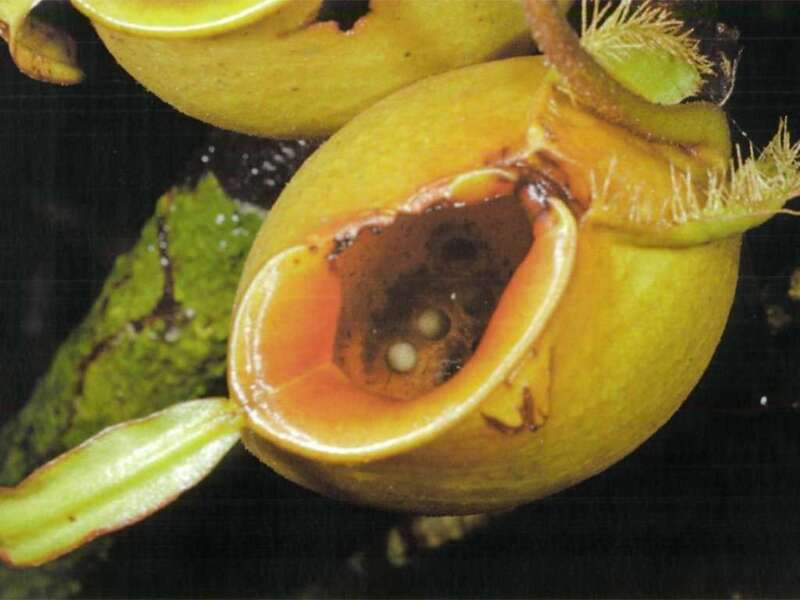 All forms have egg-shaped pitchers with circular peristomes that funnel snacks into rainwater-diluted digestive pools. Why diluted? 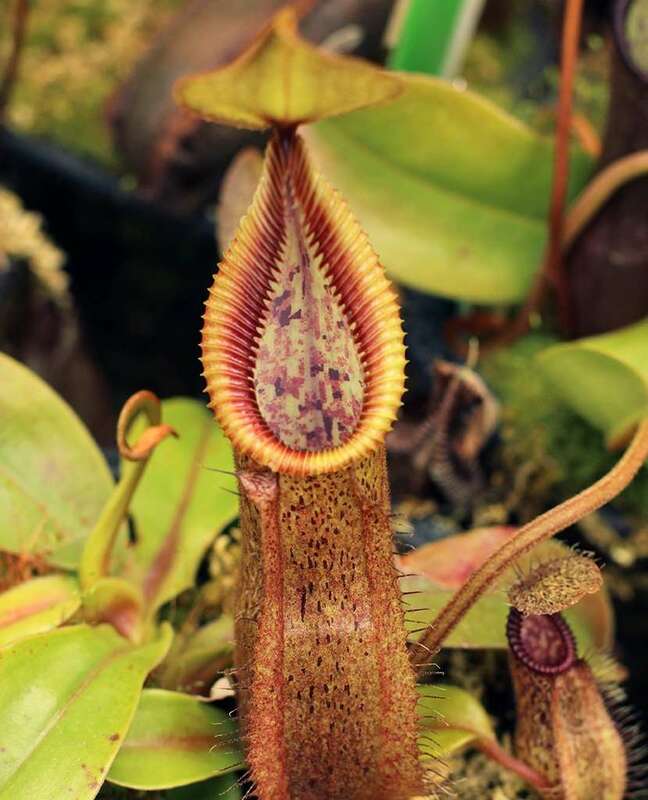 The lid of N. ampullaria is thin and points away from the mouth, providing no protection from falling rain. 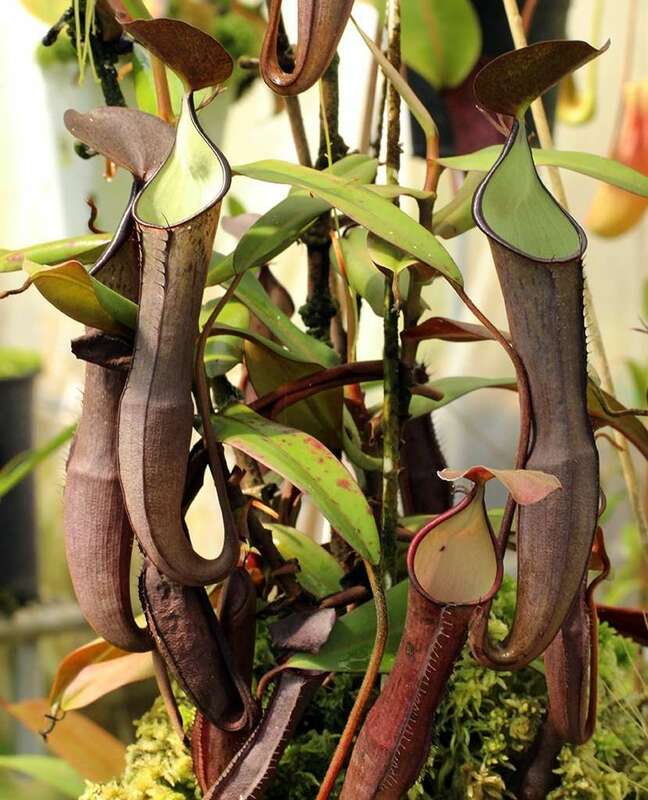 The open-door policy of these tubby pitchers also allow for leaf debris from overhead plants to fall into the opening where they decompose with the help of mutualistic organisms. 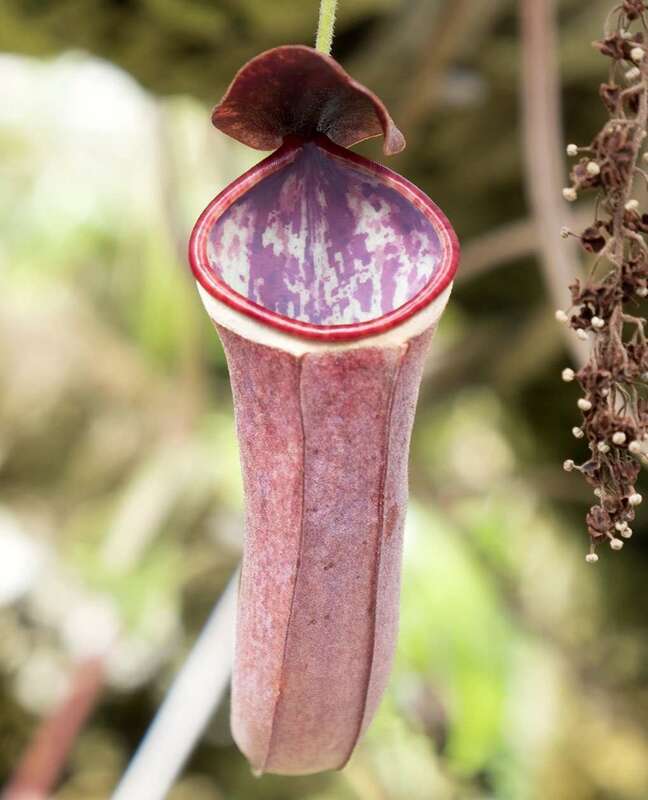 In the pitchers of Nepenthes ampullaria, Ecologists Jonathan Moran noted few animals but abundant dead foliage. Isotope measurements provided sufficient evidence that most N. ampullaria nutrients are extracted from plants instead of animals. 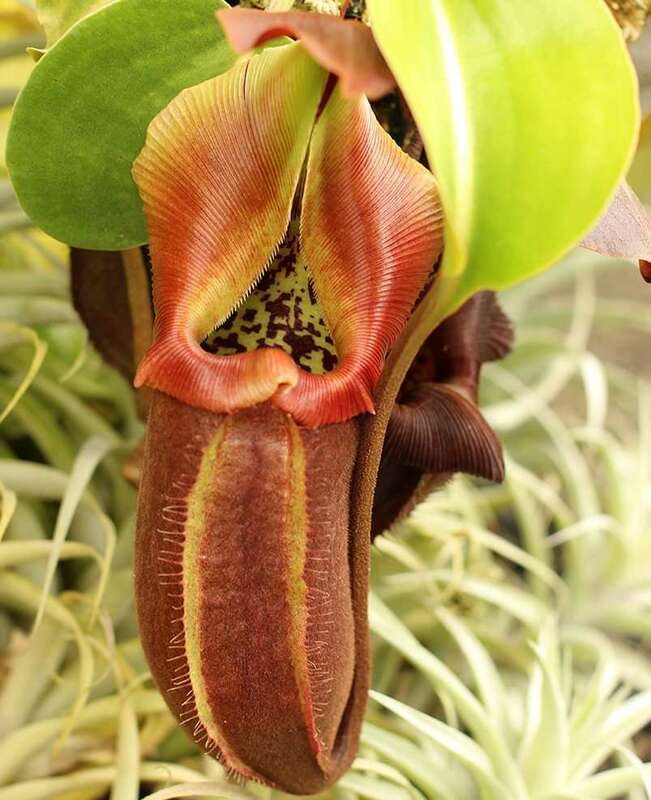 – A (almost) vegetarian carnivorous plant! To get a bit technical for a moment, it has been shown that foliar stable nitrogen isotope (15N) presence in N. ampullaria grown under forest canopy with leaf debris present is significantly lower than in plants without access to leaf debris. However, overall nitrogen concentrations are higher in leaf-munching plants compared to those grown without leaf debris. A 2003 study estimated that N. ampullaria plants growing under forest canopy derive 35.7% (±0.1%) of their foliar nitrogen from leaf debris. A 2011 study found that N. ampullaria derives 41.7% (±5.5%) of its laminar nitrogen and 54.8% (±7.0%) of its pitcher nitrogen from leaf debris, and showed that detritivory increased the rate of net photosynthesis in the laminae. 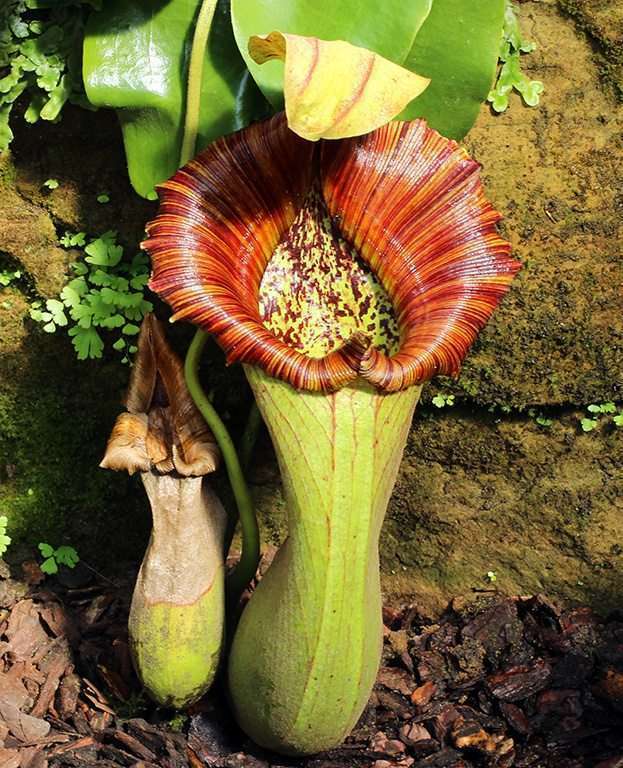 In simpler terms, N. ampullaria will eat its veggies, and grows bigger and stronger as a result. 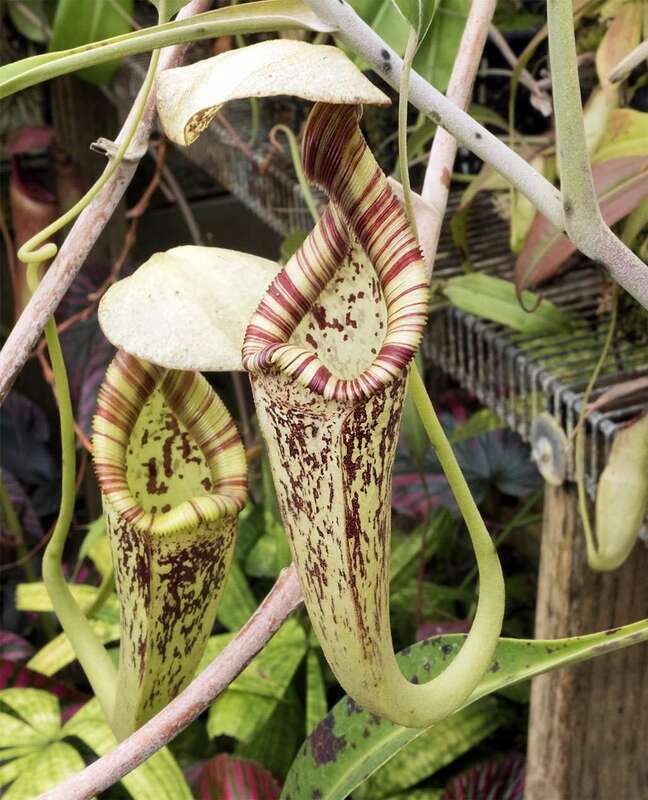 Nepenthes ampullaria needs some help breaking down and digesting all that leaf debris. It benefits from playing home to mutualistic organisms through their removal of excessive prey (avoids pitchers getting over-stuffed and rotting), secretion of enzymes, mechanical break down of prey, feeding on the plant’s prey and subsequent excretion of inorganic nutrients in the form of… poop, and assimilation of atmospheric nitrogen. 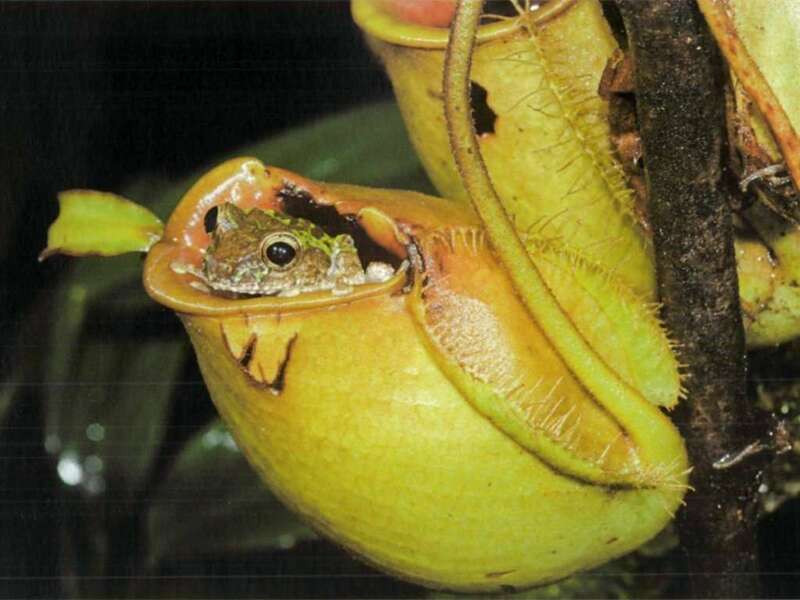 One example of the fascinating creatures that can be found in the bowls of Nepenthes ampullaria is the black-spotted sticky frog, Kalophrynus pleurostigma. 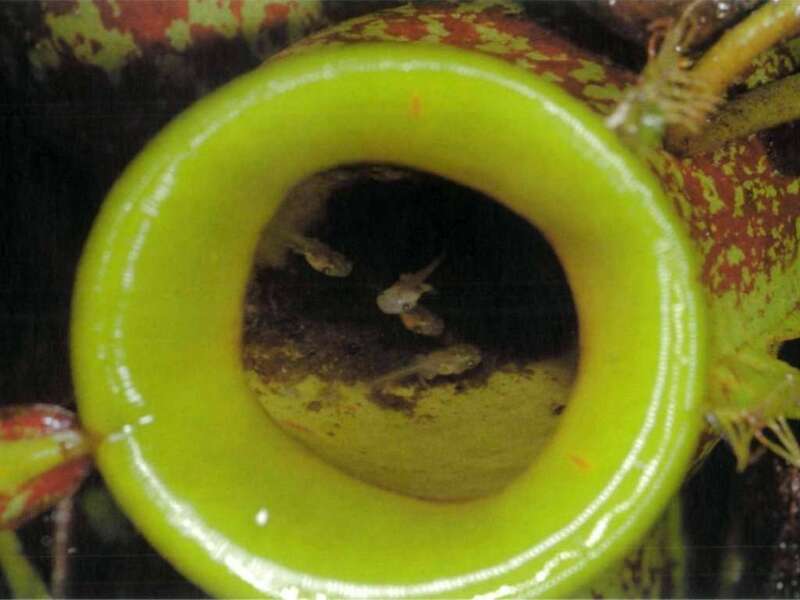 This little cutie spawns into lower pitchers, where up to 100 tadpoles can develop simultaneously within one pitcher. 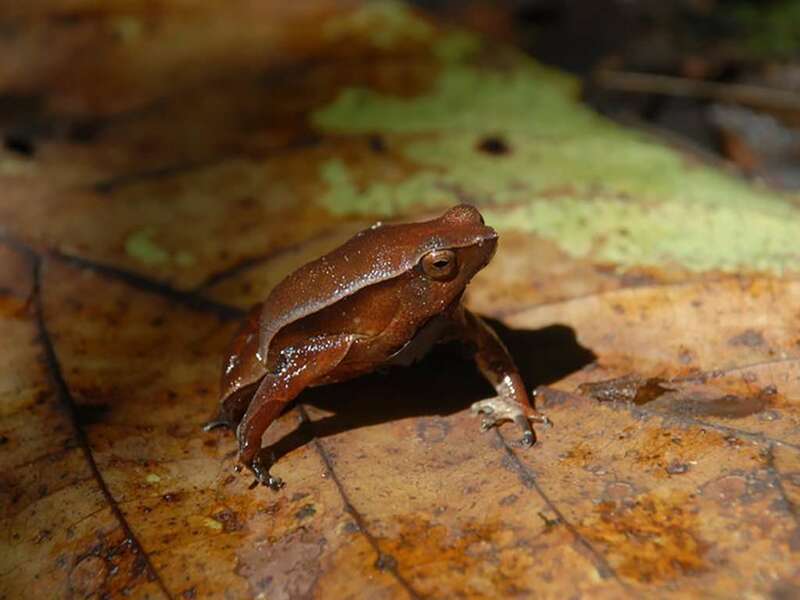 Scroll through the above photos for examples of this frog, and others, perpetuating their species and providing valuable nutrient availability within N. ampullaria. 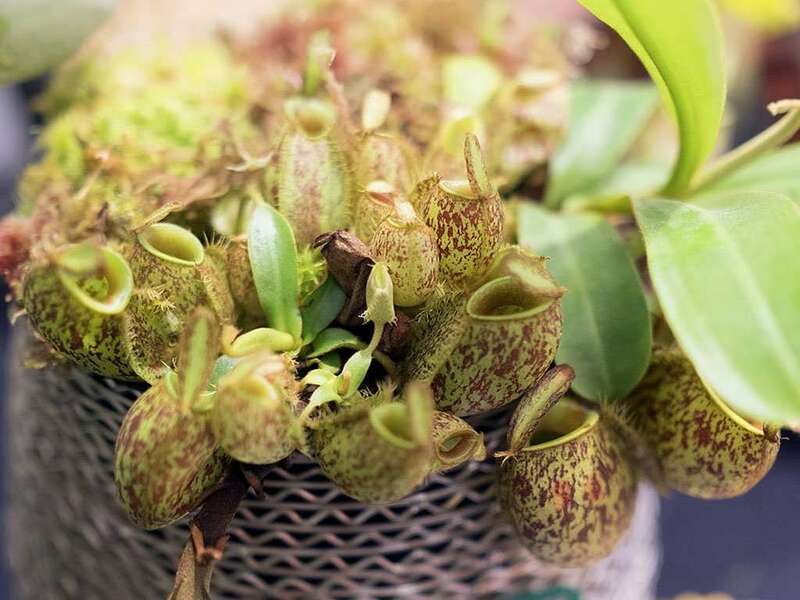 • N. ampullaria ‘Harlequin’ is a cultivar that produces red pitcher speckled in green and deep purple. • N. ampullaria ‘Cantley’s Red’ is a beautiful scarlet color with lime green speckling. 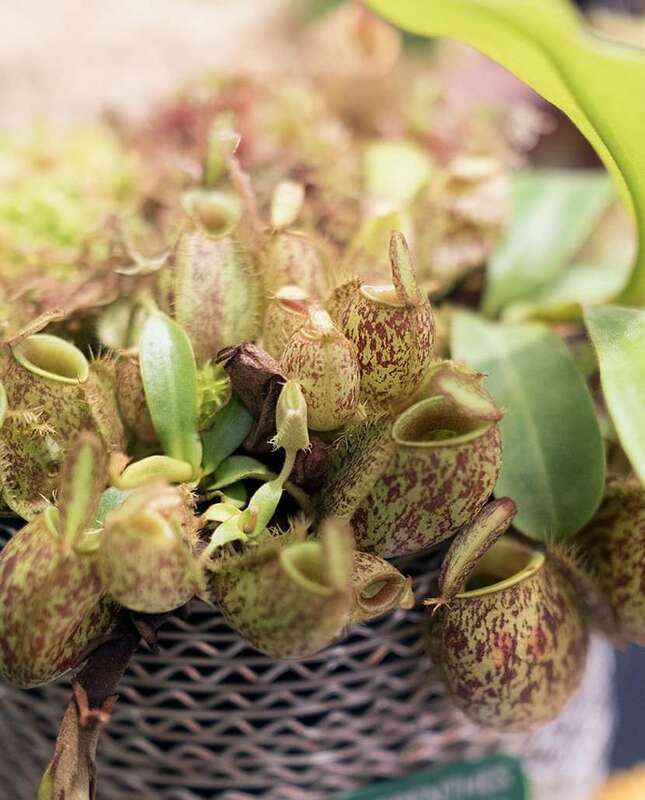 • N. ampullaria ‘Black Pearl’ has pitchers that are completely black. • N. ampullaria ‘Black miracle’ similar to the above in color, but the peristome contains green and black striping. Leaves also have a unique black speckling. 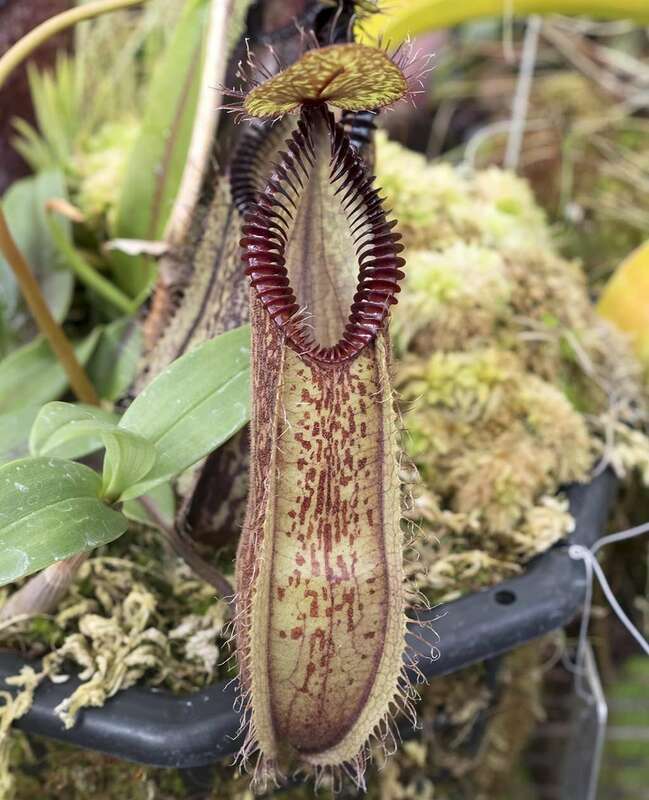 Hold up, I’m not done describing Nepenthes ampullaria‘s funky form of carnivory – it has a few more tricks up its peristome that, together, make a very convincing argument for its vegetarian inclinations. • I hate mosquitoes. You hate mosquitoes. N. ampullaria loves mosquitoes. 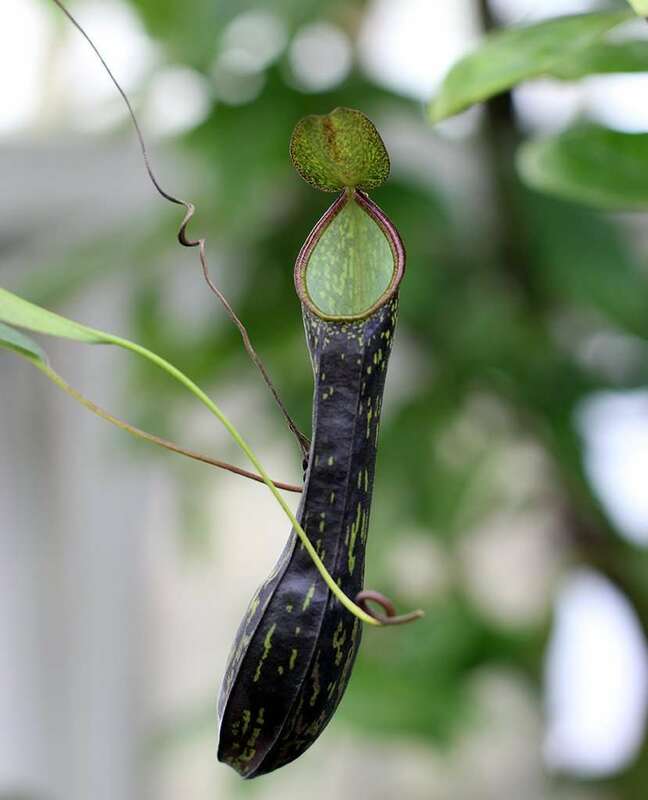 Infaunal organisms (the name we’ve given organisms that inhabit the pitchers of Nepenthes) like mosquito larvae breakdown leaf debris and help transfer nitrogen from it to the plant through the excretion of ammonium ions. Bacteria also do the same thing with leaf debris. What does this mean? 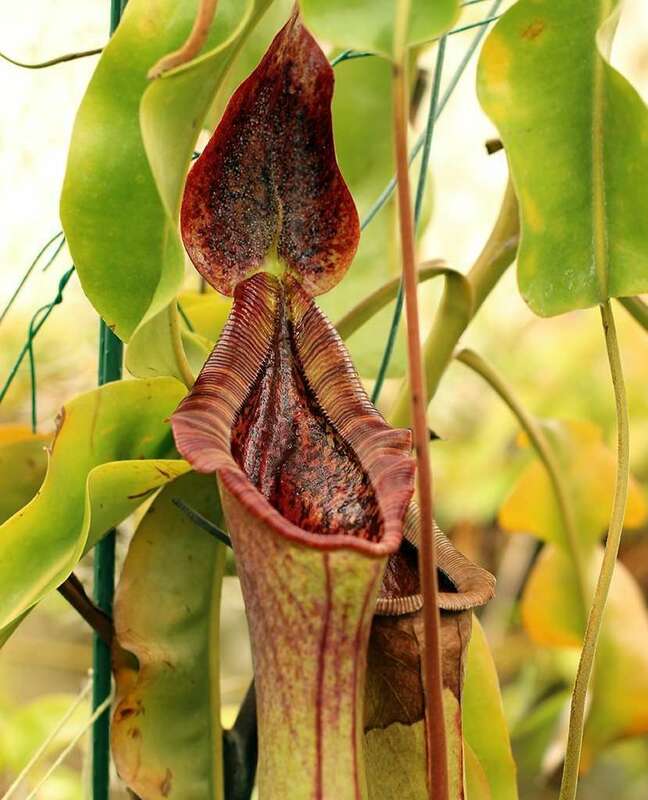 – I won’t go into gruesome detail, but N. ampullaria is quite literally a potty-mouth. Sounds familiar? 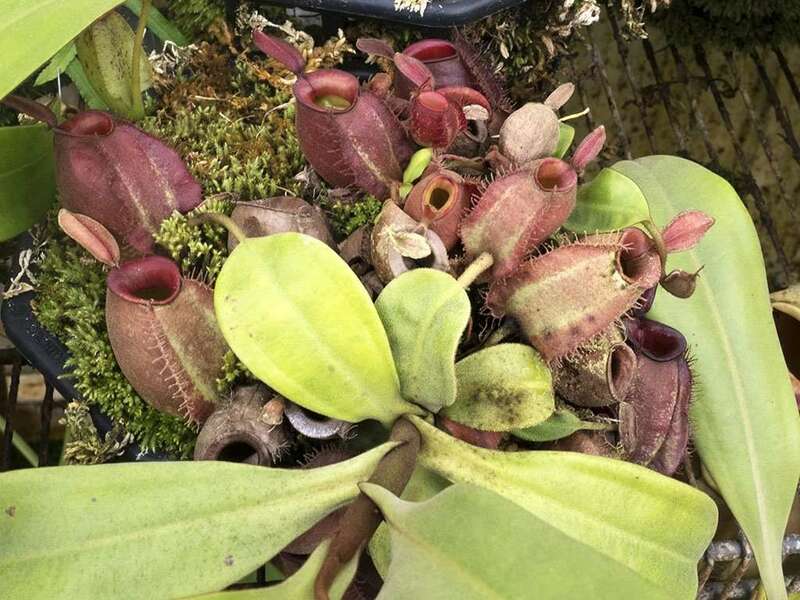 That’s because N. lowii and N. rajah use a similar, albeit more explicit, nutrient-gathering technique. 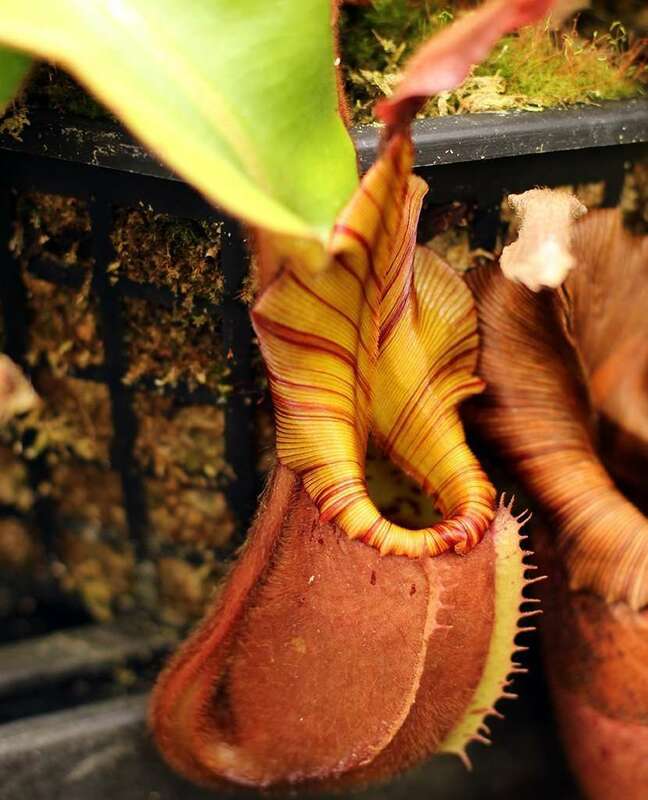 • N. ampullaria lacks the specialized cells that make the peristome slippery and causes insects fall into its mouth. It is one of just a few species in the genus to lack these “lunate” cells. 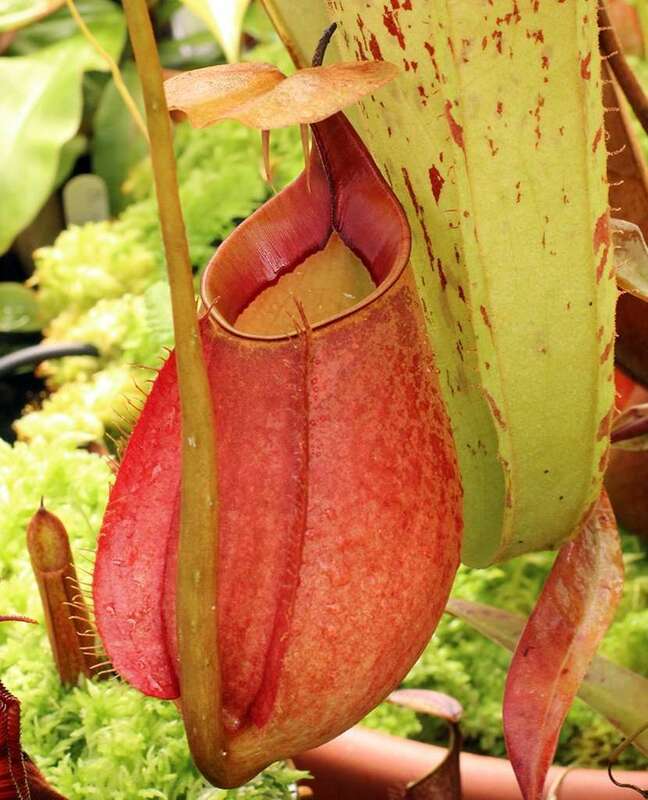 • The plant has very few, and sometimes completely lacks nectar glands. Nectar normally helps attracts insect prey to the plant. 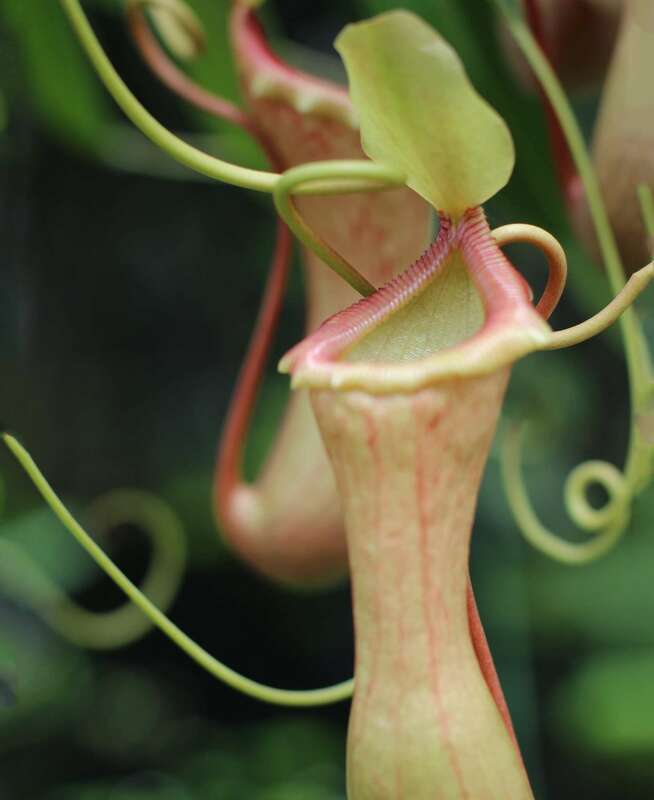 • In lower pitchers, the glandular cells inside the pitcher that help absorb nutrients extend almost all the way to the peristome. This doesn’t leave any room for a waxy zone that would keep captured prey from getting a foothold and escaping digestion. • Digesting leaf debris takes time. 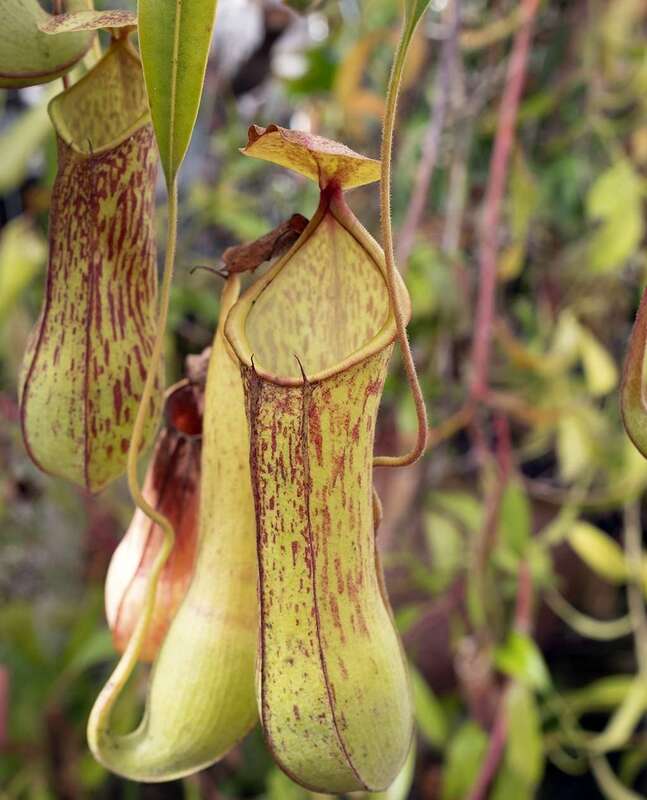 The pitchers of N. ampullaria are relatively long-lived, as the plant slowly accumulates infaunal-excreted nutrients over time. Ok, now I’m done talking about how the plant snags lunch. 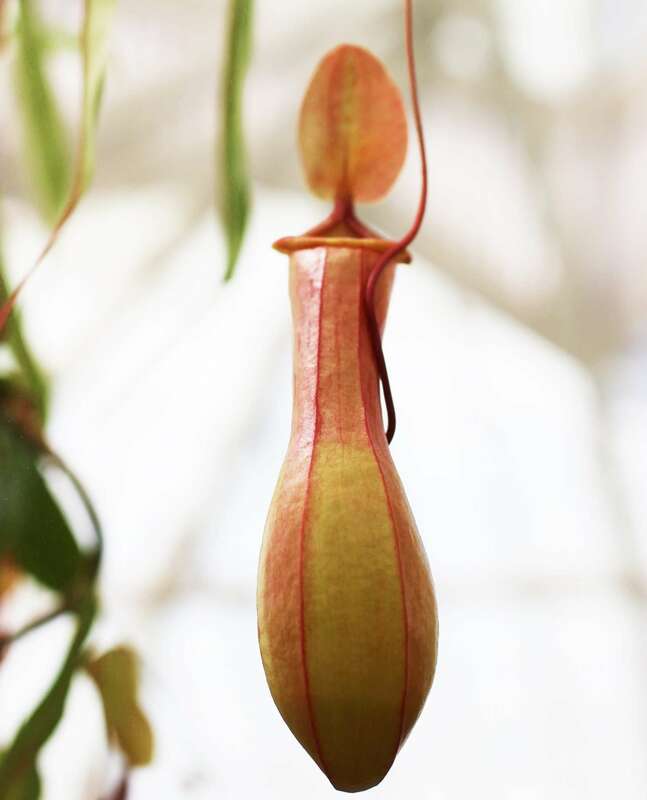 Moving on to stems, Nepenthes ampullaria vines, producing very few pitchers as they climb. 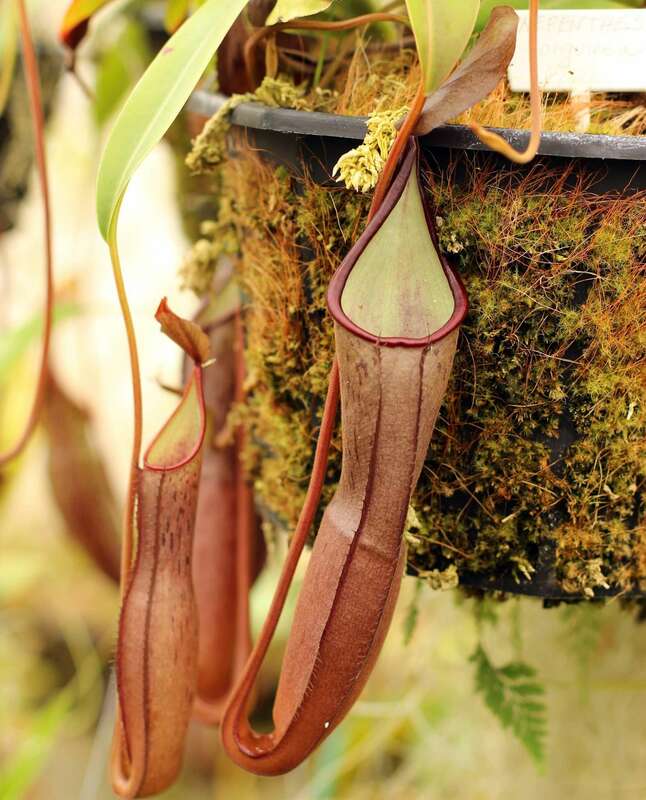 At some point during this vining, a new growth point will sprout and produce a cluster of mid-air pitchers. This makes propagation via cuttings fairly easy. 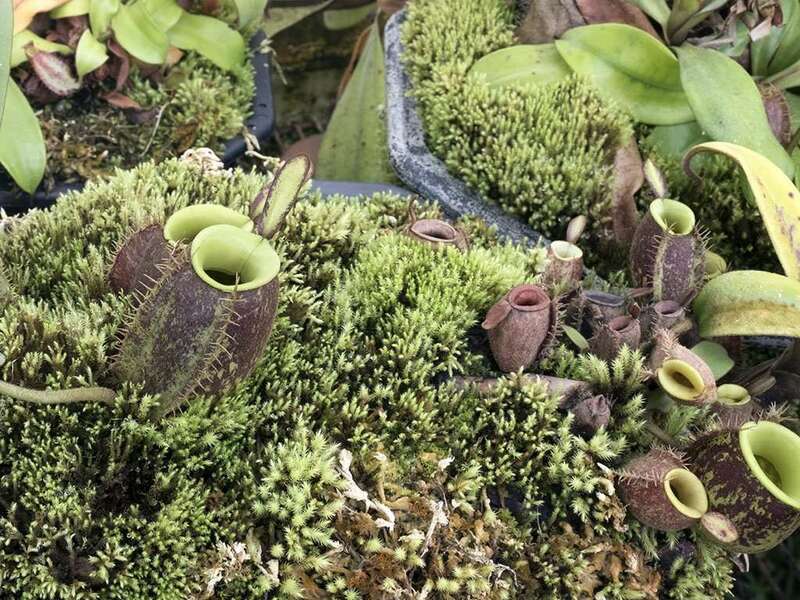 When cuttings are taken, N. ampullaria will readily produce basal shoots and form bushy clusters of ground pitchers.